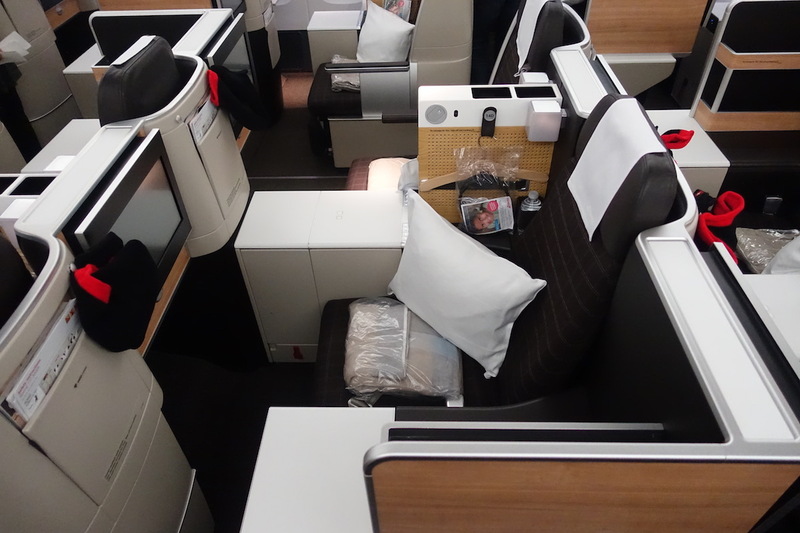 Not all business class seats are created equal, and that’s especially true on SWISS. 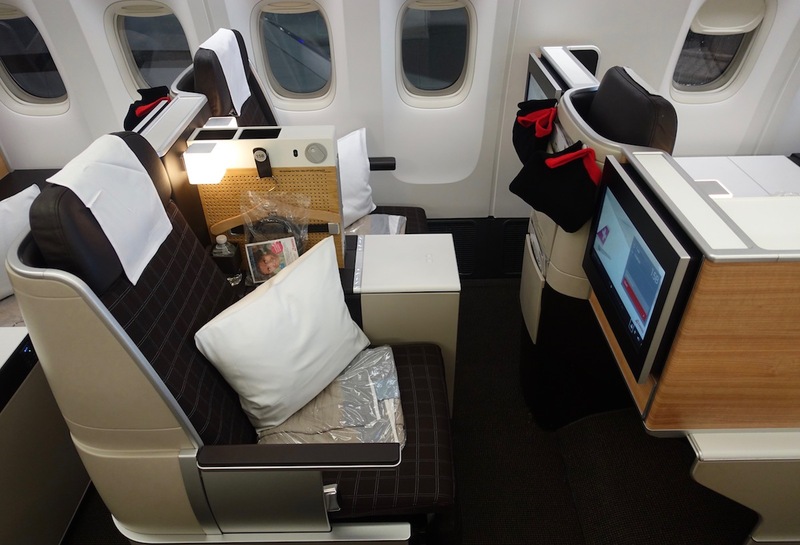 On their longhaul aircraft (A330s, A340s, and 777s), Swiss has fully flat seats in business class (check out my review of SWISS business here). They’re in a staggered configuration, meaning that in each row the position of seats alternates. Due to how this configuration works out, SWISS planes have what are often referred to as “throne” seats. As you can see, a majority of seats are in pairs, whether seated in the center section or by the windows. However, in each row you have a single seat, which is often referred to as a “throne” seat. Personally I love these seats, given how much privacy they have, and since you have direct aisle access and a window view. There is one downside to these seats, though, for what it’s worth — the footwells are quite small. 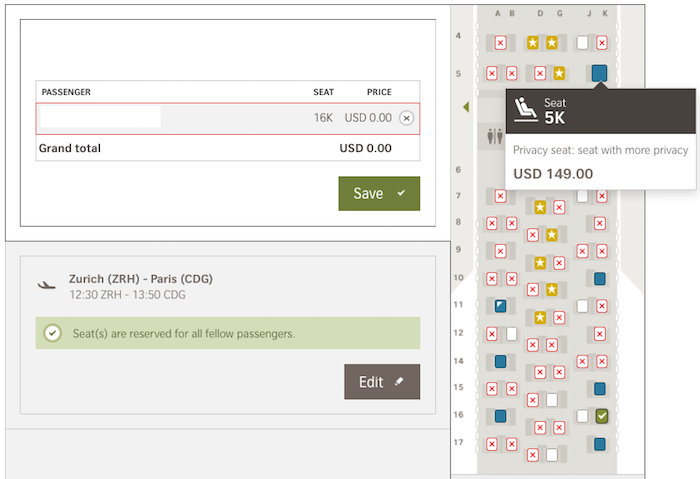 SWISS realizes that people prefer these seats to “normal” seats, so they charge $149-199 in order to reserve one of these seats in advance. Miles & More HON Circle and Senator members can select these seats for free, but everyone else is stuck paying. 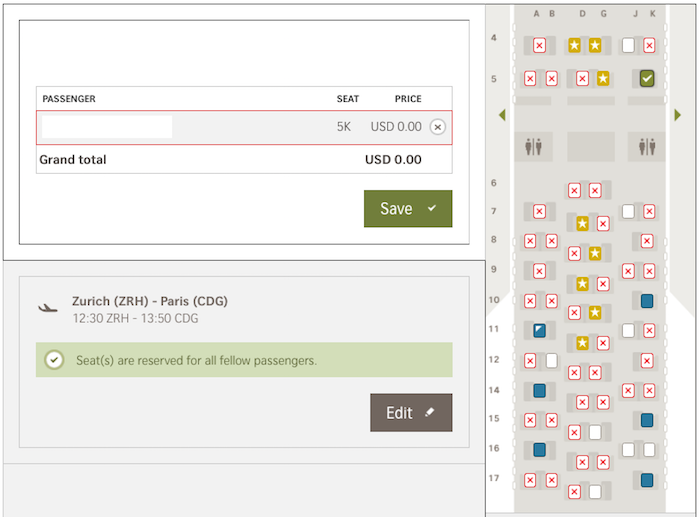 For example, below is the seatmap for a SWISS flight, which shows the cost of reserving one of these throne seats (all the seats in blue are throne seats). Obviously it varies by flight, but in my experience rarely do the throne seats all fill up in advance. There might be a few Senator and HON Circle members per flight, but beyond that, not many people want to pay cash to assign seats in business class (just don’t tell British Airways). That’s where this trick comes in handy. 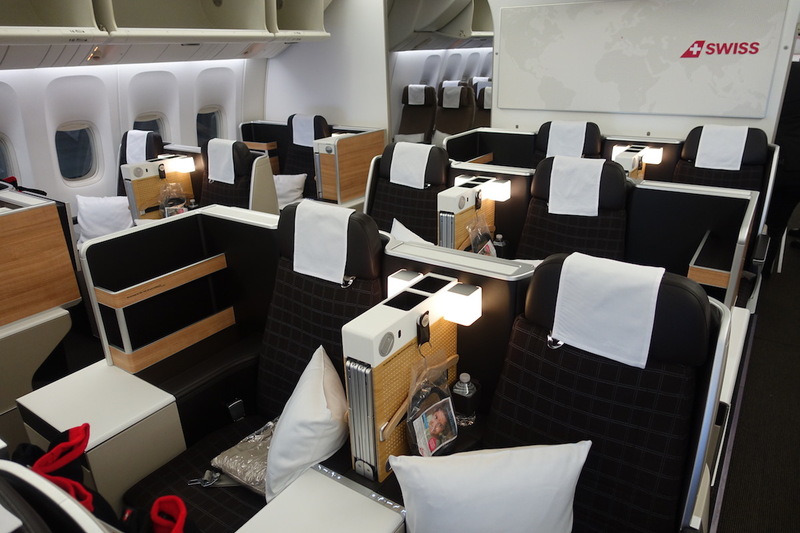 Around 48 hours before departure, SWISS business class throne seats can be selected for free. This applies to anyone in business class, even those on award tickets. Many people aren’t aware of the timing, since 48 hours seems like a random point to open them up — online check-in only opens within 23 hours, for example. Let me demonstrate in the form of an example, as I just helped someone with this. Exactly at 48 hours before departure I logged into a SWISS itinerary, and went to the “manage booking” section. By the way, if you’re going to do this, make sure you have the SWISS confirmation code, and not the confirmation code of the partner airline you booked through, as those are often different. Alternatively, you can use the e-ticket number (which is the same across airlines). Prior to 48 hours, selecting a throne seat showed the $149 price. So I logged in at exactly 48 hours, and suddenly it showed no price anymore for the throne seats. Yay… but not so fast. When I selected the seat, it still took me to a page to enter credit card information for a $149 payment, even though the previous page said it should have been free. I kept logging in and out trying to figure out what I was doing wrong. As it turned out, I may have just been a bit too excited. Maybe the system doesn’t update quite as quickly as I had hoped. After waiting about 10 minutes the throne seats no longer showed in blue, but rather in white. At this point I was able to select a throne seat at no additional cost. 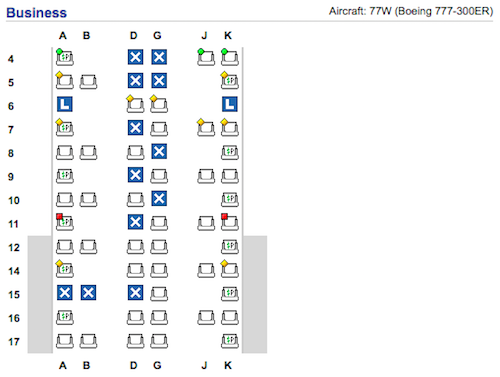 As you can see, even though the seatmap is pretty fully on this flight, the throne seats are wide open. SWISS’ business class throne seats are excellent, and can be assigned by any business class passenger 48 hours in advance. Many people don’t realize this, so it’s a way to save $149-199 on SWISS’ best business class seats. Now, in some cases it’s possible there won’t be throne seats left 48 hours, and it may be worth paying. However, I think you’ll find that a vast majority of the time they are still available, so there’s no reason to pay. You can always monitor the seatmap as the departure date approaches, and then decide whether or not it makes sense to pay before the 48 hours. What has your experience been with assigning SWISS throne seats? Being a tall person who travels atleast twice a week, I cannot bare sitting in regular economy because of the legroom (AA Executive Platinum has spoiled me). Before I had this privilege though, I would wait until the flight was near and I could select the extra legroom seats for free. That really helps when you don’t have the money to pay! 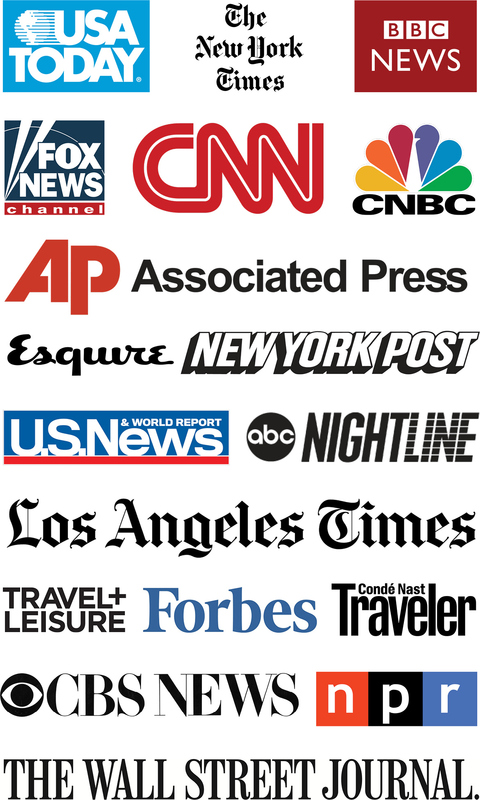 Do the seats blocked for elites (the orange stars) also open up to anyone within 48 hours? Or is it only the throne seats? 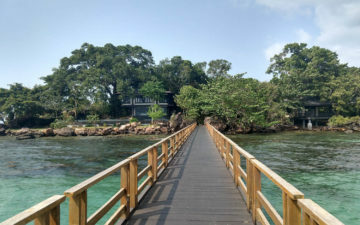 It also work if you’re a star alliance gold member. 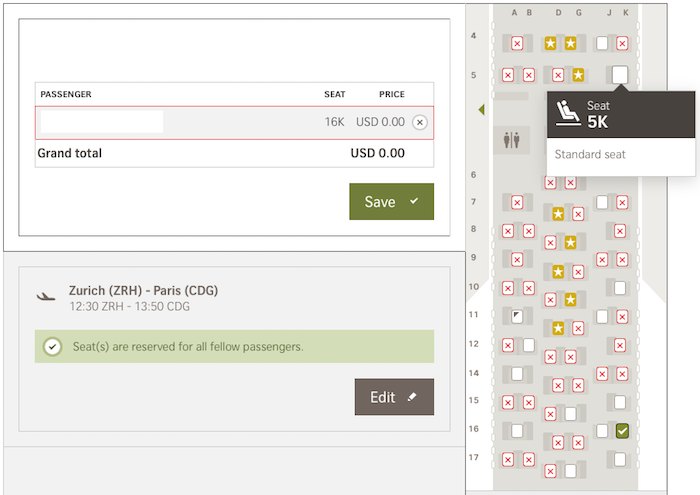 You can also reserve emergency row seats for free in economy when you do online check in, even though they’d normally cost 30€ If you’re a star alliance gold member as well. Another hack is that Austrian opens check in 48 hours in advance, and Lufthansa only 36. You can check in to any LH group flight using the websites of LH group carriers (OS, LH, LX etc. ), giving you a head start in seat selection. I tried this last June about 24 hours in advance of a SWISS flight from ORD-ZUR and was unsuccessful. There were thrown seats available on the seat map. At the time of the flight they were all occupied. I have a SWISS flight in June from FCO-ZUR-BOS. I’ll give it another try then. Fingers crossed! Hmmm, wonder if this is also the case on Austrian too. Be aware that Swiss will bump you out of those seats the moment another M&M member shows up… not even Senator level, as long as they are “local” (to Swiss). And they will not inform you, will just hand you new boarding pass at the gate with no explanation. I find them horrible. They have ZERO space for the body, but they have lots of space for stuff and personal objects. I would never fly on the again. I find it great to sit down and relax,m but impossible to sleep as it’s too narrow and there is no space for the feet. Austrian, which is indeed the charming way to fly, doesn’t charge extra for the throne seats. However, I booked an award flight on SWISS using Aeroplan and bought the throne seat. I had to cancel the trip, but SWISS would not give me a refund on the upgrade. I, therefore, do not like the SWISS right now. You were lucky to find out the 48 hrs free of charge throne seat selection. 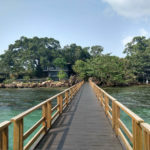 My experience (worked for 30 years in an airline in the software development department) is that it is a matter of no time for an airline software programmer to change that figure from 48 to 23 and then you can select the throne seat free of charge if it is still vacant only while online check in. I flew Swiss with my wife and loved it. First row together was perfect. Read too many rows about the throne seat being overrated and squishy. Dreadful legroom in the throne seats – I flew once before (when *A Gold) and on return trip made sure I wasn’t in that one. The foot cubby/coffin is dreadful. Does this work in economy? Would love to assign seats without the huge fee associated with each flight. This is the biggest problem with Swiss business class: it feels like you’re joining a lottery. Maybe you’ll get a great seat, maybe not. I avoid their long haul flights now because I don’t feel like it’s a reliable experience. Not correct, Austrian charges EUR 189 for all throne seats, except for row 7, because it’s close to the galley. At least on OS 81 they do. Been there, done that, will do again. I agree with another comment these seats are terrible to sleep no room for the elbows which is already limited on all of their seats but on those it’s even worse. I’ll avoid like the plague on an overnight flight. I set my timer to opening time for online check-in for my J flight on Austrian’s 777-200LR. was able to get seat 1A throne seat and my god it was glorious. Ernesto and the rest of the throne-haters are absolutely right. You’re in a coffin from the waist down, can’t bend your legs or sleep on your side, and you need to curl your toes to get into the thing. We need a bit of regicide I think.